Even though revenues for the bike rental industry are predicted to grow over the next few years, the industry is becoming increasingly more competitive with fewer bike retailers taking a larger share of the revenues. For bike retailers to benefit from the increase in biking awareness and more bicycle friendly cities, they need to adopt better strategies to compete in the market. The high touch nature of the bike rental industry where multiple customer interactions need to be seamlessly handled makes it imperative for the bike retailers to use equipment management software. Equipment management software allows bike retailers to handle both front and back office operations efficiently. The software helps increase customer retention, sales, and decrease costs and loss by tying together customer demands and inventory needs, improving operational efficiency, and attracting more business. Bike rental software meets the many challenges of the bike rental industry- from customer service to inventory maintenance. Due to the high touch nature of the rental business, the software is an excellent tool to save time, decrease costs and increase customer reach and profits. EZRentOut offers a cloud-based solution to any bike rental business’ rental management woes. It is an equipment rental solution that requires no hardware or software setup, providing a complete end-to-end solution that offers supercharged integrations, customer management, and order tracking. EZRentOut can help your SMB make customers happy and be the very best at what it does! 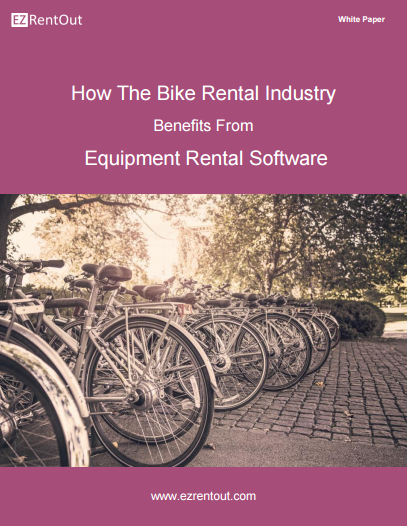 EZRentOut is the proven equipment rental software used by bike rental businesses all over the globe. Sign up today for a free 15-day trial.